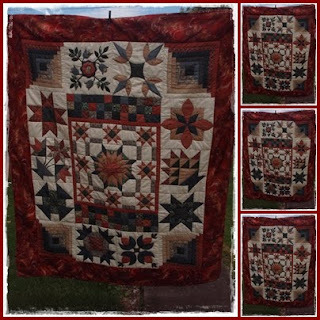 Amy at Amys' Creative Side is hosting the 4th Bloggers Quilt Festival. I have decided to join in the fun. This is a great way of seeing some very beautiful quilts. This quilt is one of those quilts that I never thought I would finish. 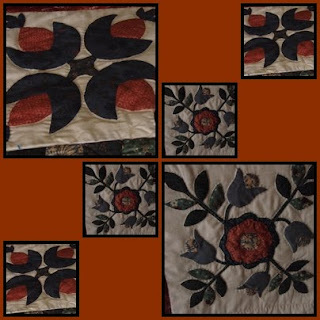 It's an American sampler and was the quilt my Quilting Bible Study group - The Rose of Sharon Quilters - made in our 3rd year of quilting, about 9 years ago, unfortunately I am not one to label my quilts so I am not sure of the exact year. 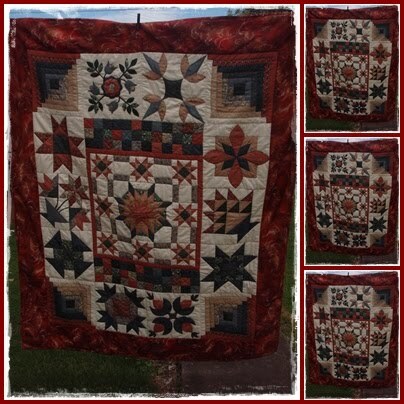 It took me over 5 years to finish this quilt as I was very upset with the centre panel so I just put it away for several years. This quilt taught me many blocks and techniques and will remain one of those "lifetime" quilts. My favourite blocks was always the log cabin -even b4 i started quilting, this blosk just fascinated me, so I just loved learning how to. The turkey tracks was a challenge to get those curves right but i was very happy I persevered and got it done (I may never sew curves again though). I had always wanted to learn how to make a basket block and I got to learn 2 differrent baskets in this quilt. to hand quilt as well. 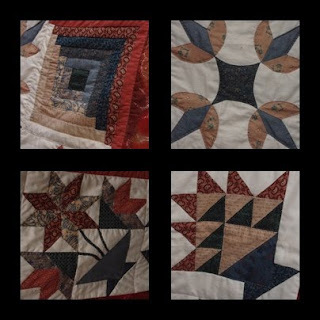 The first block I tried to hand quilt was the log cabins and I just loved ther sanil trail quilting and this is how i always quilt log cabins now in my mind this is the only way to quit them (for me). 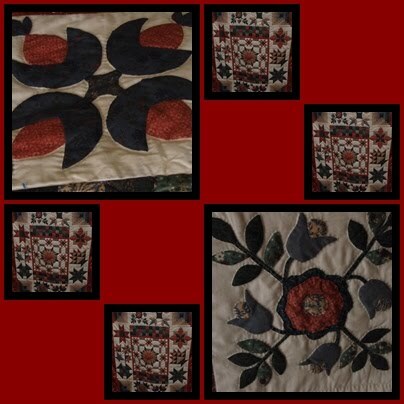 Each block has some form of hand quilting, some more than others. Two of the blocks were hand turned applique and with many of the techniques int his quilt this was very new to me. I have since learned a much simpler way and hand applique but this was a great technique to learn and have under my quilting belt. These two blocks (& the 4 log cabins) are completley hand quilted. The hand quilting took me three years. I am so glad I did part hand quilt it but I am not sure i would ever tackle such a large project to hand quilt. Love your quilt gail.I also have my quilt I learn new blocks on but mine still needs binding added to it to be finished.I also struggled with the curve of my drunkards path block but like you finished it and have never done another curved block lol :) Barb. Beautiful, the colors are so fall! That is one gorgeous quilt and the hand-quilting is divine! I really love the colors too. It's beautiful. Good for you that you persevered with it. Beautiful quilt! So many details. Not sure that I could attempt something like this. So impressive! I love how you put many different samples of blocks into one.